But that’s all beside the point because my confidence in Waid going forward is, in large part, independent of his four published issues of Daredevil. Rather, it derives from the two extended Waid runs that I have read, Fantastic Four and his own ongoing creation, Irredeemable. From those two works, combined with the seeds planted in these first four issues, I see a great future for Daredevil while Waid is writing it. Waid’s Fantastic Four is noteworthy for any number of reasons, but it is its tone and focus to which I wish to draw particular attention. Throughout the run, there is a mood of playfulness, fun, and humanity that is often lacking in comics, though you can see it in books like Amazing Spider-Man, Incredible Hercules, Power Girl, or Guardians of the Galaxy. It is often a simple acknowledgement that super heroes, like just about everybody else, are people with senses of humor. (Is there any easier way to get readers to care about a character than to give her a sense of humor?) 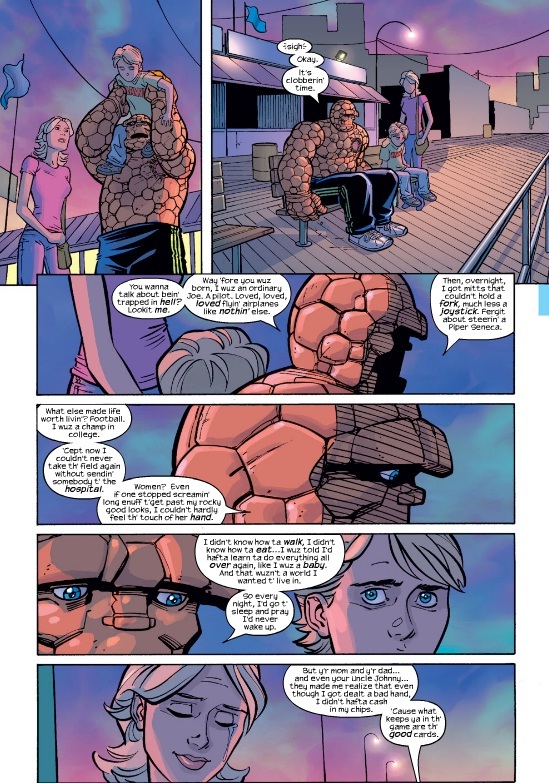 And so it makes sense for Ben Grimm to douse Johnny Storm with the world’s largest water balloon, for Reed Richards to crack up when Ben Grimm sounds like he’s been huffing helium, for Sue and Reed to banter like a couple still in love. But it’s more than having a few jokes sprinkled in. Rather, it is evidence that Waid’s Fantastic Four featured these icons as fascinating people who happened to be super heroes, rather than as super heroes who sometimes acted like normal people. And it is precisely because Waid worked to establish characters (rather than costumes) that those stories in which things go bad are so powerful. It is considerably more powerful when Reed and Sue’s son, Franklin, has been sent to Hell by Victor Von Doom than when Mr. Fantastic and the Invisible Woman are trying to rescue the universe’s most powerful being from Dr. Doom. In Irredeemable, Waid explores several fascinating themes, but I think the manner in which he does so is most relevant for his work on Daredevil. Specifically, Waid has shown that he can deftly develop and use a supporting cast, and that he can create, tease, and reveal a mystery. While the Plutonian is ostensibly the title character in Irredeemable, the real stars are the group of seven heroes who are trying to figure out what the hell is going on with him. 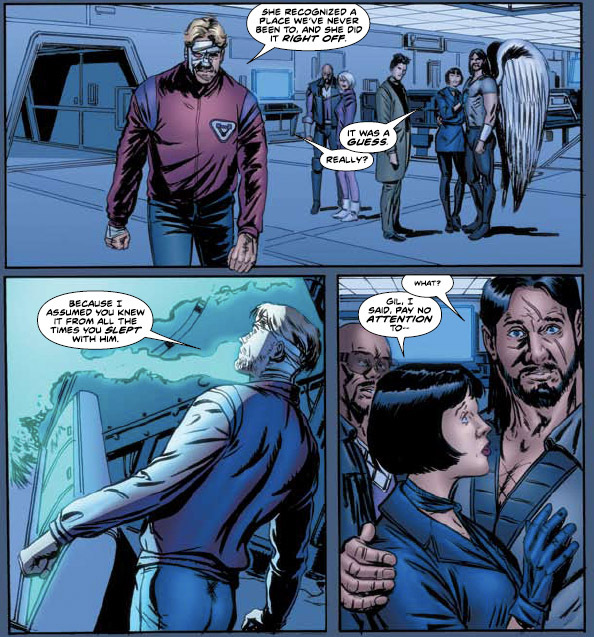 Waid devotes the bulk of his storytelling to the interactions between these characters, to fleshing out their histories, to making them matter. They are never treated merely as storytelling devices to move the Plutonian plot along, though they accomplish that as well, but as characters whose stories are worth telling in their own right. Combining these elements with the four issues of Daredevil published, and acknowledging that Waid is not simply going to repeat himself, the future of Daredevil starts looking pretty good to me. There is that playfulness of tone and that emphasis on Matt Murdock as a person trying to enjoy his life outside of times when he wears tights. And I see that as an essential precursor to making those times when Matt finds himself beset by darkness really matter. (And they will come!) There is a renewed emphasis on Foggy and the addition of new members to the supporting cast (including a lady friend for Foggy! ), though it remains to be seen how integral to the book those not named Foggy will be. There is, in Matt’s renewed interest in practicing law without actually practicing law, ample opportunity for Daredevil to investigate an endless number of little mysteries. In sum, it looks like Waid is setting up a book that can utilize those storytelling skills that he has so expertly used in the past. And that’s why I’m confident in Mark Waid’s Daredevil. Conway and Gerber were the bomb, check ‘em out again. 🙂 I wouldn’t say I’m as confident as you are, but I do think Waid is doing a nice job of rebuilding the world. The past year and a half or so has not been a strong time in Daredevil lore. There was Shadowland, and loosing his book, and loosing his “man without fear title” (for some reason) etc. I think Wade has things back to basics. It wasn’t a very organic transition but it did need to be done. Congrats on the first post!